Greens Leader Mark Parnell is adamant the Leigh Creek project should not go ahead, "based on research over many years and the experience of Linc Energy in Queensland”. Underground coal gasification (rebadged in South Australia as In Situ Gasification) has been experimented with around the world since the early 20th century, but almost all these trials seem to have run into technical problems or created serious pollution, or both, and been abandoned. Leigh Creek Energy effectively began when the South Australian government granted a petroleum exploration licence (PEL 650), covering part of the Leigh Creek coalfield, to a private companym ARP TriEnergy Ltd., in 2014. Save the planet �or save your cash? The�Adelaide Independent Reporter�is an independent news site.� It is not run on behalf of any commercial interest, pressure group, trade union or political party. THE REST OF THE SOUTH AUSTRALiAN fire danger season is likely to remain hotter and drier than usual, according ot the Bureau of Meteorology. The February to April outlook, released by the Bureau on�January 17, puts the chances of getting more than 50 mm of rain in the next three months at less than 55 per cent for most of South Australia, except the Adelaide Hills, Kangaroo Island, and the south-eatern corner of the state. The February to April median (mid range) rainfall for these areas between 1990 and 2012 was between 100 and 200 millimetres. This year they are thought to have only a 65 to 75 per cent chance of beating that. 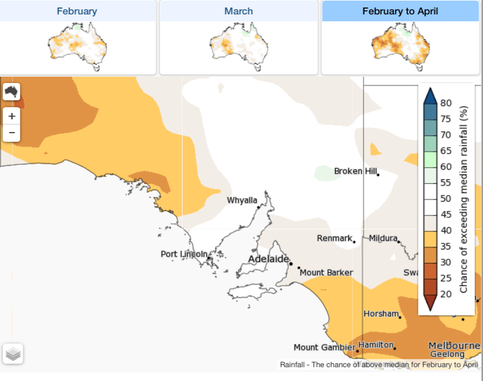 Western parts of South Australia in particular �are likely to be drier than�usual�for the next three months. However, forecasting is not an exact science, and the Bureau’s accuracy in predicting rainfall at this time of the year is less than 50 per cent for most of the state. Even for the Adelaide/Yorke Peninsula and KI regions it has only been around 55 per cent. But the Bureau’s modelling still suggests "tropical Pacific sea surface temperatures are likely to reach El Ni�o levels through early autoumn and then return to neutral”. Temperatures are likely to remain above the 1990-2012 benchmark for most of the state for the next three months. 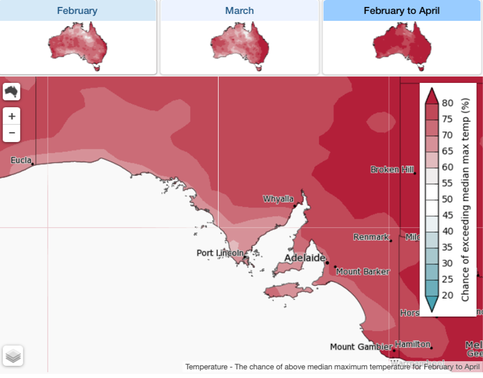 The Bureau’s map of South Australia’s temperature outlook. Eastern Eyre Peninsula - November 1, 2018 to April 15, 2019. Flinders Fire Ban District - October 22, 2018 to April 15, 2019. Lower Eyre Peninsula - November 1, 2018 to April 15, 2019. Mid North - November 1, 2018 to April 30, 2019. North East Pastoral - October 22, 2018 to March 31, 2019. North West Pastoral - October 22, 2018 to March 31, 2019. West Coast Fire Ban - November 1, 2018 to April 15, 2019. Yorke Peninsula - November 1, 2018 to April 15, 2019. Mount Lofty Ranges - November 17, 2018 to April 30, 2019. Adelaide Metropolitan - November 17, 2018 to April 30, 2019. Kangaroo Island - December 1, 20018 to 30 April, 2019.